The world's first ultra-short projector with advanced laser display (ALPD) technology delivers up to 150 inches of full HD quality. Elegant yet durable design, Xiaomi Laser Projector is carefully engineered with the user in mind. Experience cinema like no other in your own home. Search and cast via Google Assistant and Chromecast features. Watch your favorite apps such as VUDU, Hulu, SlingTV, YouTube, and more! Simply place the projector near a wall and enjoy audio and video in high definition no mounting required. Create a clean set up for your home theater. Best projector ever! With 5000 lumens you dont have to pull the shades to blacken the room. I bought this a year ago and never looked back. We play everything on this; video games, movies, tv, photos, etc. 150 inch screen on any wall. Sound quality is good too. 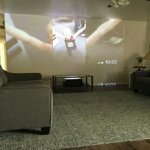 This projector from Mi is incredibly powerful. I was surprised to see how clear the image was during a product demonstration. And of course, the 150 inch display blew me away. You can tell this is a quality piece of technology. Every feature is well thought out with the consumer in mind. With a lifespan of 25,000 hours (enough to watch 12,500 movies), you don't have to worry about replacing this device for years. The sound quality was also great. This is great to watch movies or stream YouTube/Hulu -- perfect to turn your living room into a home theater. I received this product as part of a giveaway. I'm giving this projector 5 stars because of its outstanding image quality. 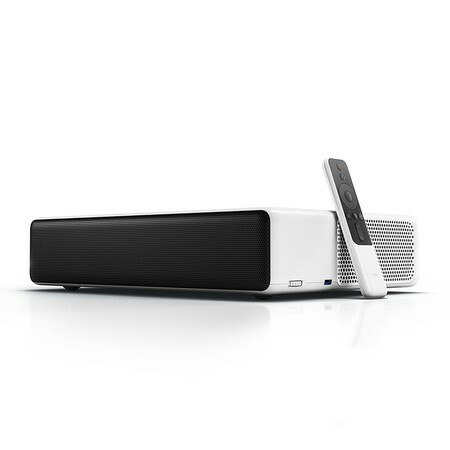 It is really exceptional compared to my previous LG UST projector. Much brighter and better focus in the corners. Actually looks a TV versus a projector. My only complaint is the remote which does not include a standby more so the projector had to boot into Android TV every time. Since I don't use the built in apps, that just wastes time for me. Hopefully a firmware upgrade will fix this. But even so this is a minor annoyance when considering the image quality for this UST projector. I got this projector b/c of its short throw capability and I don't have a big room to use conventional projector. It is running stock Android TV OS with built-in ChromeCast which I found pretty convenience to cast from my Galaxy phone. Comes with Google PlayStore installed so can install any apps that you want. Bluetooth feature is nice and I can connect to my bluetooth mouse and keyboard for better navigation. Picture quality is good and depends on the project screen material. I'd recommend to use fixed project screen since it has better flatness. It is a little pricey but I think all short throw project is in the same price range. Overall I'm happy with the purchased and more movie nights to come. I wasn't expecting this, I am awe struck! Exceptional projector, which high image quality at this price. 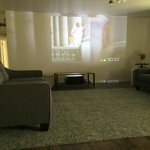 This short throw projector with android OS installed within does everything that you want from a home theater. Am not an expert at image quality but this projector has satisfied my needs to have a great movie night with my family. The in-built speakers are adequate for a small bed room. This product deserves 5 starts but Netflix and Amazon video doesn't work out of the box due to legal issues, so I had to hookup a Roku stick to make that work, hence struck off 1 star. The minimal remote is well though design and it surpasses the quality test, honestly I was expecting such a good quality product from a Chinese company. It is a shame that no other companies are exploring this sector apart from LG which is also doing some good stuff, but Mi projector at this price surpasses all that. Must buy if you want a home theater experience. Full HD quality with HDR, no 4K but am very satisfied with HD quality at this price when I see Sony is selling a short throw 4K project at $25K which is insane. Walmart doesn't let you upload videos to review do uploading a GIF for you guys to see what it looks in real life. Don't go by the GIF quality I had to compress it to make 5MB, the quality is much better in real even though my wall is not an even surface and room is not completely dark. overall is great: color and size. but there are problems with customer service (none, Xiaomi couldn't verify that Walmart is an authorized reseller, and won't provide support). It doesn't work with HDR mode via FireTV 4K stick. The CPU is slower than advertised, 4k 60fps seems to jitter a bit while viewing smooth scrolling video. The fan is a bit noisy, but get can used when surrounded by audio. First of all I'm not paid to write this review. I actually bought the projector at full cost entirely out of my pocket. The size of the image this projector projects on the screen, within literally a few inches, is amazing. The other amazing thing is 26000 hours lamp life which is for all practical reasons unlimited. Beyond that this projector is not unique any more especially considering it's price tag. I compared this projector at ~$1700 price range (advertised to emit 5000 lumens) to my ViewSonic PX700HD (bought at around $400/around 3000 lumens) and my BenQ TK800 (bought around $1000/around 3000 lumens). Out of all of them BenQ markets TK800 as a 4K projector and the other two are 1080p. The image quality on all these three projectors more or less was the same under the same room light intensity. So clearly the advertised 5000 lumens is far from reality. I noticed that all three projectors were doing ok under 50% LED brightness but at 100% brightness the image quality was washed. Xiao Mi along with BenQ have good speakers. Xiao Mi comes with Android TV built in. I couldn't find and install Netflix app on it though. Not sure what the problem is. But the setup process other than that was easy. Lens shifting to correct the image angles was working flawlessly on Xiao Mi. One thing regarding the effect of ultra short throw was that the slightest disturbance in the screen was showing. That's not the case for other projectors. So that's something to consider. e.g if there is a lot of air flow in the area you installed the screen, you will easily notice it on the screen. Also you may need to invest more on a good screen. The unit aesthetically looks really good though it's big. Overall my main motivation was the ultra short throw feature to replace the TV in my family room. I was hoping that in the design of the house I wouldn't need to plan a room for a TV and instead have this projector there and use it on demand. However I realized that the image quality, the light intensity and the problem with the screen disturbance with the price tag on this project is less than practical. Not good at all. Super loud fan, horrible colors , there is basically no decent blacks at all with this everything is washed out. oh and randomly turning off due to heat issues. I honestly don't understand on youtube and other reviews they say this is a good projector. maybe they are paid to say that?? this here is a real review, from a real buyer, and what i say is this image quality what id expect from a $200 budget projector. Oh customer service is very slow too! be warned oh that if u have issues....After buying on line, i had to physically return my projector to a walmart store in order to get a replacement, now its been over 2 weeks,and i still dont know when my replacement will arrive . ill edit my review IF the replacement projector is better experience than my 1st one. Completely overpriced and the advertised ANSI 5,000 is a flat out lie. I work at a large tech company in mountain view, you do the math, and brought this projector in to test it in one of our labs. The measurement we came up with is around 1,800 ANSI brightness at best. The image quality is great but the brightness is a flat out lie! Don't believe the other reviews, the majority of them are fake // paid reviews with terrible photographs and all claiming 5 stars. DO NOT TRUST THEM! That's honestly the reason why I took the time out of my day to write this. I recommend going with an Optima, ViewSonic or Epson if you're in the market for a good bright projector with the same image quality for less than half the price. My 1 year old Epson 2045 outperforms this projector hands down in combined image quality and brightness are going for around $600-$650 right now.